Coming from a small school can hinder any NFL Draft prospect, but this is especially true when you are a small school prospect who plays one of the most stacked positions in an entire draft class. 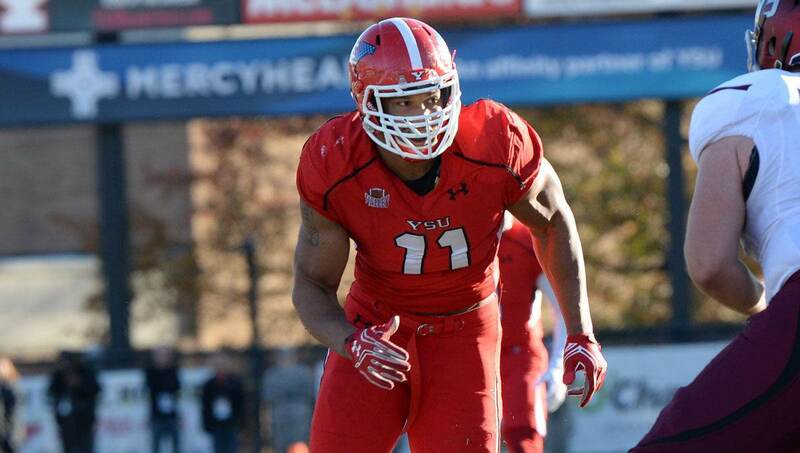 This is the case for Youngstown State’s defensive end Derek Rivers, who while ignored by many draft evaluators over the last few months, bursted onto the scene with a great week at the Senior Bowl. Not a highly recruited talent out of a high school, Rivers has bulked up from his slender build a bit, and has gotten himself NFL-ready. Rivers possess a first step that every NFL team will salivate over, and a speed rush which will make many do the same. His best trait is that first step quickness. Rivers comes off the ball explosively, playing with a jet-pack on his back, especially on obvious passing downs. If your offense gets into a 3rd and long situation against Rivers, he will pin his ears back and get to the quarterback right now. After that first step, Rivers shows the ability to be an effective pass rusher at the next level. His speed rush is clearly effective, but with active hands, strong counter moves, and good-enough power rushes, Rivers draft stock is deservedly rising. Rivers is able to come off the ball with quickness, swipe the offensive linemen’s hands off, and then quickly flip his hips parallel to the quarterback. His ability to use his lower body in addition to his hands and length make him an intriguing NFL prospect. Rivers further impressed me with his overall athleticism against the run. Facing a zone read play here, the quarterback is hoping Rivers will follow the offensive tackle down the line of scrimmage, so he can pull the ball right where Rivers was supposed to be. Rivers remains both disciplined and patient, as he does against the run on almost every snap, remaining square and forcing the quarterback laterally. Shuffling down 2 yards deeper than the line of scrimmage with great feet and hips, Rivers does not over pursue and puts himself in position to make the tackle. Against the run, Rivers is able to beat slower offensive tackles off the ball and cross their face to make plays. He also does a good job of keeping his pads clean and shedding blocks with a quick swim or rip at the point of attack. Derek Rivers is a disciplined player who plays well within the defensive system. He understands what he is being asked to do, and does that job very well each and every snap. What makes him special, however, is all of the extra stuff he can do. Rivers made a ton of splash plays at the college level, and was downright dominant at times. Of course, you have to take into consideration the level of competition Rivers was facing, but the traits which he possesses make him a day two NFL prospect regardless of where he played his college ball. I wouldn’t be surprised whatsoever if Rivers if off the board before the third round.